How do I get rid of “System Data” that takes up half my hard drive? Is this a known issue with updating Android or is this a new thing? That is probably a bunch of stuff you should not remove. For example it could contain the Android OS file images that are mounted during start up for your different directories: /system, /data , /sys, etc. These are things that are vital to your phone running, and thus removing them is a bad idea. After reading the question again and looking at screenshot this may be reffering to the System data stored on your /data partition. If you can tap that entry and see if it gives you any more details as to what it is reffering to. This probably contains the OTA update in full (along with other settings as well). So you could possibly drill down inside of the system data option to see what is all there. 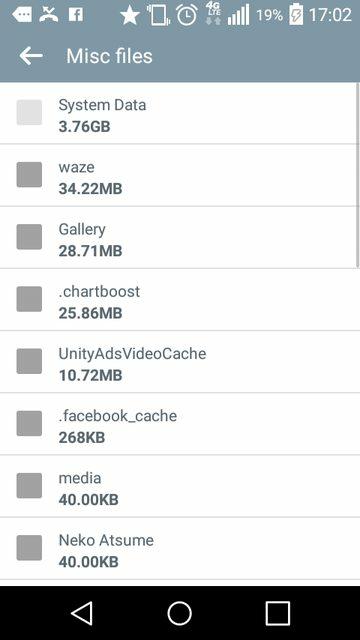 an Update Zip is going to be rather large (for android and mobile device files anyways) on the order of 300-400 MB + (depending what is all in it). You would be safe to delete the OTA files since they are no longer used after the update is installed, BUT AGAIN A WARNING... This System Data Items Entry is probably reffering to a lot more than just the OTA download itself I would not just delete that entry I would instead go in to it for detail, and if none is given there then use something like ES File Explorer (once open in app settings>view check the box for showing hidden files) and go looking in /sdcard/ for a directory containing most likely a zip or a couple zips (may be separate zips for the ROM, Recovery, Fastboot, Radio, etc. depending on your device and manufacturer and how they handle things). Reminder: as long as your google account is syncing correctly all your app data (not all apps but the majority have this enabled) along with your contacts (and even pictures if you set that up) are all sync'd back to Google so even if you delete this whole directory and have issues and have to do a factory restore and wipe all data when the phone starts up and you login again it will re-download all that data for you. Just be sure to go in to system settings>Accounts and tap google and tap the entry for your account and make sure every box is checked (is OK if browser data has ! and you see a chrome entry there your OEM browser is failing to sync but Chrome is not and has everything) Also can uncheck items if you don't care whether the data is backed up or not (like Google Fit LoL). I will still leave the original answer below as others may find the info useful. The system partition by default is not accessible to the user. NOW that is not to say it forgot to clean up behind itself if you did an OTA update. Without rooting your phone the only way to probably adjust this is to grab a factory zip from LG for your device and flash it using their instructions. This will remove everything in system and do a fresh install. You are right though it should not be anywhere near that size. If you are not using a rooted device you will never be able to write anything to that /System mount point so as long as the phone works it really does not matter if that partition is maxed out it will never be written to anyway. If you don't notice other little issues, and are happy with the phone I would just use it as is. Even if you have root again you will not be placing anything in /system (if you do it will be one or 2 tiny things mostly). /system does NOT affect /Data so no matter how much storage your /system uses it will never take away from nor add to the storage space in /data. For instance even if you update a google app that is installed in /System Android actually installs the update to /Data and stops using the version in /System (while still leaving it there untouched in case you go to Settings>Apps> and tap Uninstall updates. If you do this it removes everything for the app in /data and begins to use the copy in /system until the next update). Basically, Android writes things to System during SYSTEM install (and that only really happens through the recovery menu not the actual Android OS itself (the recovery menu can actually be thought of as a second tiny OS that lives inside your device alongside the full larger Android OS kinda) and after that everything gets stored on /data and nothing gets written to /System only read from (it's a security thing if the system can write to /system so could say a virus which would be a bad thing). Not the answer you're looking for? Browse other questions tagged 5.1-lollipop or ask your own question. How do I get my mobile data to work again, after the new Android 5.1 update? How can I stop adverts from “System Update” from showing up on my lockscreen on a Micromax phone?